The Tarragon Theatre has opened its 45th anniversary season with a sure-fire hit – Rebecca Northan’s Blind Date. Northan’s unique show has played Toronto twice before and New York and London and toured across Canada and the U.S. How I could have missed it during the last seven years I don’t know. It is thoroughly delightful. If you have seen it before, you will want to see it again. If, like me, you have never seen it, be sure to remedy that mistake as soon as possible. 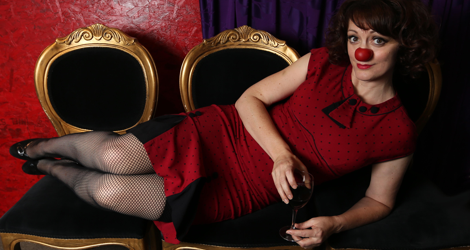 The set-up for the show is that Mimi (Northan), an attractive young woman from Avignon wearing a red dress and a red clown nose, has been waiting for two hours at a little French restaurant for her blind date to show up. After consulting the audience about whether she should wait any longer, Mimi asks if any man in the audience would be willing to be her blind date for the evening and selects a volunteer. What follows is an amazing 90-minute-long play that Northan improvises with her volunteer. The point of the play is not to embarrass the volunteer, rather just the reverse. Much of the play’s humour comes from Northan’s encouraging the volunteer to act as naturally as possible as if there were no audience watching and from our surprise at how quickly the volunteer seems to forget he is on stage. In many ways the show is a celebration of the volunteer himself since Mimi encourages him in a non-judgemental fashion to reveal so much of his life and personality. The suggestion is that everyone has a personal story that is worth sharing and treasuring. Should the volunteer feel uncomfortable at any point or wish to ask a question about what’s going on, he can call time out and go with Northan to the time out box she has designated downstage right. On opening night it was Northan, not her date, who called all the time outs. One time was to encourage him to ask her more open-ended questions and to speak directly to her, not the audience. Another was to praise him for how well he was doing. Basically Northan takes the awkwardness that is inherent in any blind date and magnifies it by putting on stage. The stage setting also emphasizes the paradox of the theatre between public and private. Actors, of course, are used to enacting private interactions between characters before an audience. For the non-actor volunteer, the question whether he can or should act as if he is not being watched becomes increasingly amusing as Mimi leads him into increasingly more intimate situations. In this way the humour in the show is as much about the nature of theatre as it is about blind dates. Another aspect of theatre that Blind Date highlights is the notion of play. Too often we assume we leave behind the ability to play when we enter adulthood. As Northan shows, this is not true. Much of the fun of her improvisation with her volunteer is how easily the volunteer adopts the same mode of miming that Northan uses. At one point on opening night Mimi reminds the volunteer that he has to duck his head when exiting an (invisible) door, which he duly does every time thereafter. Northan is a master of suggesting through posture and gesture what she would like the volunteer to do, and we can only laugh while wondering when the volunteer will catch on to what is so obvious to us. Once disinhibited, however, the volunteer proceeds to mime other things Mimi had not even suggested. A wonderful sense of giddiness imbues the whole piece that comes from two strangers getting to know each other, from a layman getting to learn the rules of the stage and from the paradoxical meeting of reality (the volunteer) with fiction (Mimi). The show necessarily will be very different for every performance depending on Mimi’s choice of date. It can also be different because the audience has to vote on which of two endings it would like to see. And, besides that, Northan’s understudy, Christy Bruce, takes over the role for matinee performances. Thus, to enjoy the full potential of the show, one visit is hardly enough. Just make sure you don’t miss Northan’s show while it’s here. Photo: Rebecca Northan as Mimi. ©2015 Michael Meehan.